"... stunningly beautiful... gorgeously illustrated. (Spicer) is a master storyteller and meticulous researcher, and The Age of Sail is a book well worth having." 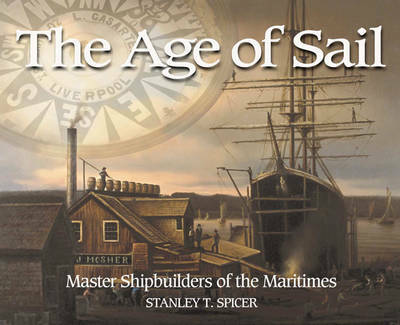 - Canning Gazette "... an impressive homage to Maritime shipbuilders... Spicer's meticulous research and fine storytelling are enhanced by the wealth of illustrations that accompany the text. More than 150 paintings and photographs, many of them archival, create a visual witness to the craft that was so essential to the Maritimers of the 19th century. "The Chronicle Herald "The Age of Sail will have lasting value as a source of excellent illustrations and photos. "- The Northern Mariner The 19th century was the age of shipbuilding in the Maritime Provinces, as all along the coast men were turning trees into ships that would sail on the oceans of the world. Farmers and fishermen became master craftsmen, building huge, deep-water vessels. In this beautifully illustrated volume, marine historian Stanley Spicer recaptures the age of sail and its many colourful characters. From hundreds of shipbuilders, Spicer has selected the Troops of Saint John, the Killams of Yarmouth, Joseph Cunard in Bathurst, the Peake family of Prince Edward Island, John Young of Lunenburg and the Moshers in Avondale. Through these often larger-than-life figures we explore the triumphs and tragedies of the Maritimes' great age of shipbuilding and ship owning. The Age of Sail draws on a range of rich visual resources including ship portraits, archival photographs, engravings, and artefacts displayed in the collections of leading Maritime museums, adding depth to a gripping historical account. "The book is a pleasant read. Spicer and the publishers are to be commended for producing this book...The Age of Sail will have lasting value as a source of excellent illustrations and photos." --Bradley T. Shoebottom "The Northern Mariner "
"The book is a pleasant read. Spicer and the publishers are to be commended for producing this book...The Age of Sail will have lasting value as a source of excellent illustrations and photos." ..".stunningly beautiful... gorgeously illustrated. (Spicer) is a master storyteller and meticulous researcher, and The Age of Sail is a book well worth having."